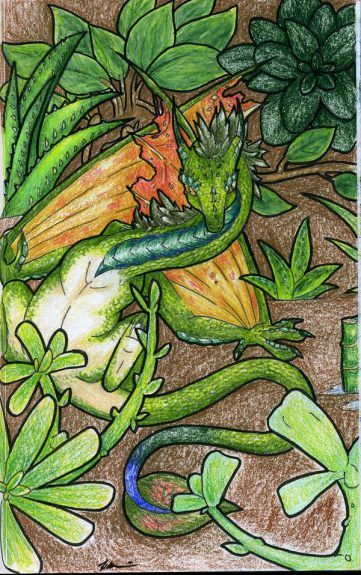 I was scolded for my desire to draw such a complex creature at first, but regardless, I took to the geometrical patterns of scales and reveled in the freedom and joy of being able to form these mythical beings exactly as I pleased. As I grew, I began riding and caring for horses. The majesty of these animals, the speed and power, were something I wanted to capture on paper. This moment marked the start of something wonderful; creating images of real animals. From horses, to the dogs I walked, to the other animals I saw around me every day; I was able to draw inspiration from every one of them. Growing up in Arizona didn’t hinder my drive as there wasn’t any shortage of wildlife, even in the city. Coyotes, hawks, snakes, lizards, spiders, and scorpions were commonplace and as such, convenient models for my progressing artwork. Even then I found reptiles to be amazing creatures, despite my mother’s reluctance to allow me to keep anything except a single pacman frog (definitely not the best option for a novice owner). I longed for more. I wanted to see and build relationships with other animals beyond my reach. My only way of doing so at that time was to craft them through my art, even if I didn’t have them right there with me. Without a shortage of physical and virtual examples to pull inspiration and ideas from, I drew. The variations of color, form, and texture in all the animals I drew fed my talents; my art blossomed like a desert rose. After a year in California, my art and life had come to a screeching halt. I had been left homeless and had to focus on surviving rather than any form of creativity. I was only able to maintain my relationship with wildlife and nature by hiking frequently in the plentiful hills and forests of the central coast. After a few years, I sought safety and stability in a small apartment in Massachusetts. In doing so, I mistakenly brought myself into an abusive relationship, and distanced myself further from the animals I loved. I was drained and had nothing left in me to create with. After years of trying to convince myself I wasn’t suffering, I finally found the strength to expel that person from my life and sought healthy companionship elsewhere. In June of 2017, I bought my first leopard gecko, Erume’, at a reptile expo in New Hampshire. She fell asleep in my hands on the way home and that day I fell in love with reptiles all over again. She made me feel loved and accepted. And without the constant need for attention that a dog or cat might have, it gave me the freedom to work on and care for myself. Her bright yellows and pinks helped to mend my broken soul, her smile brought out my own again. With the help of such a small animal, one that can’t even feel or understand the passion that I felt for her, I understood how to be again. I felt a purpose and she brought new spirit to my artwork. I feel like because of her, I was able create again, not just attempt at it. From her I, as most other keepers always do, found myself with several more reptiles. At the same time, unlike most owners, I toiled away to make art to honor and celebrate their unique characteristics. They gave me a desire, a need, to create again. The artistic fire inside me that felt extinguished for years roared to life once more. Beginning again with reptiles was ironic, if not cliche. My rediscovery was like going back to my dragonic roots, and now exploring further. While I still have days where I’m barred from my passion, thanks to my physical and emotional pain, I enjoy it again now. My geckos have brought new and old strengths back to me, and changed my life for the better. I followed my heart, and I’m now able to breed leopard and crested geckos. My dream is to share these marvelous animals with people in the hopes they may find the same wonder and hope I did. My breeding business is my life because my drive itself is a result of not only my love for reptiles but also my love of art. 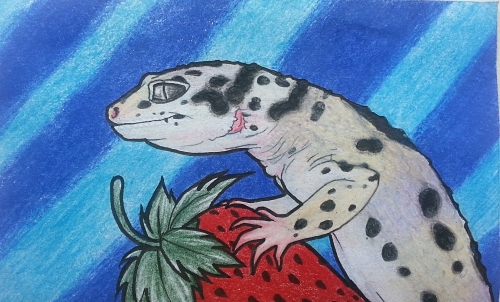 I focus on making every hatchling as sweet and friendly as my first leopard, just as I focus on making every drawing as animated and colorful as the creatures I mean to honor. 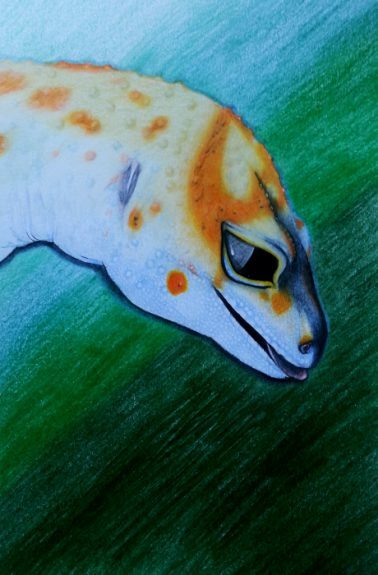 In addition to breeding and selling, I create small art pieces to go to the geckos’ new owners inspired by the nature of the animal itself. There are days where I feel I have more creative ideas than I have outlets to display them! Despite my never ending hunger to create, I feel like I will never run out of new things that catch my eye and rekindle my passion. The variety of color and form in reptiles is astounding, and as such, I am so grateful that I found a way to progress and express the interests I’ve had since my youngest moments. It makes me feel like the kid in class who insisted every day he wanted to be a fireman, finally realizing his dreams as the sirens and red engine below him roar to life on his first call. In the future I hope I can reach people beyond the confines of the “reptile hobby” world. 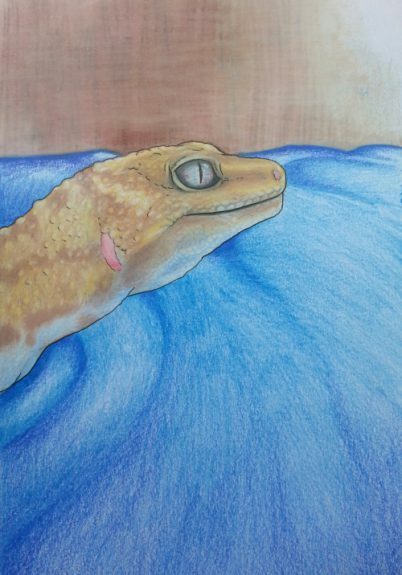 I already try to educate the general public as much as I can about reptiles in everyday life while introducing them to my animals, or showing them artwork I have done of them. Through these simple actions I’ve qualmed some people’s long time fears of reptiles and helped to cultivate more of a possibility for understanding and compassion for these misunderstood creatures. If the opportunity arose, I would love my abilities to contribute to the conservation and protection of endangered reptiles, including those that are kept as pets such as the blue spotted tree monitor (Varanus macraei) and the crocodile monitor (Varanus salvadorii). Reptiles have healed me in more ways than words can express, and they continue to do so every day as my artwork grows and changes with their influence. I feel it’s only right to return the favor. 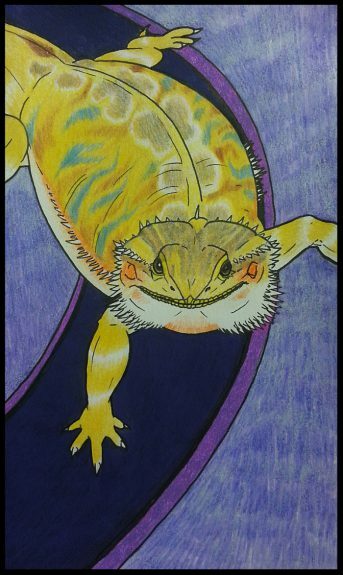 Rayne LaRose is a reptile artist and breeder in Lowell, Massachusetts. Rayne began doing artwork at the age of 11, and is completely self taught. He has worked with mediums including acrylic paints, soft pastels, and even sculpting with clay. His favorite remains high end colored pencils due to their ability to express the extreme detail he feels is needed to properly portray his subjects; animals both wild and tame. He has experience caring for all sorts of animals; from equines, to rodents, to of course, reptiles. He currently holds a job at Target, but hopes to expand his art and breeding business, “Raynestorm Reptiles”, to a point where he can quit day jobs altogether and focus on what he loves to do. He plans to move back to California within the next 3 years with his soon to be husband, Kenneth Manwill. Once moved and settled, he seeks to expand beyond his current gecko projects into larger species like bearded dragons and blue tongued skinks, as well as eventually monitor lizards and crocodilians. Wow,great art! Erume looks like my gecko Saffi! What an inspiring story & write up from Rayne. 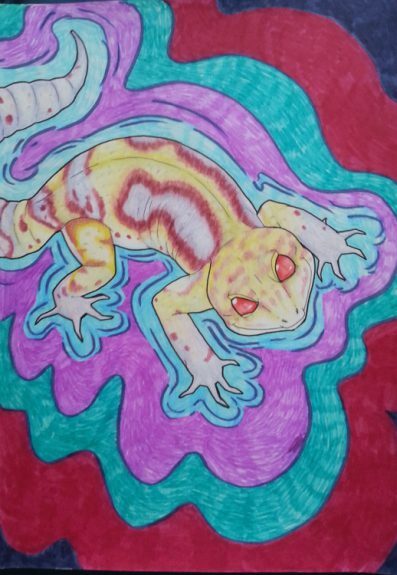 His artwork keeps him sane & his love for reptiles seems to be positively influencing his goals. Good luck & all the best. May he succeed in his way forward & find happiness that seems long overdue.